Juan Enrique Rubio | Network, Information and Computer Security Lab. Mr. Juan Enrique is a PhD student at the University of Malaga, who receives funds from the Spanish Ministry of Education under the FPU program. He obtained the Bachelor's degree in Computer Science in 2014 and the Master's Degree in Computer Science in 2016, both with distinction by the same University. He has been a collaborator in the Department of Computer Science since 2013, and his research activities today are focused on the protection of critical infrastructures. 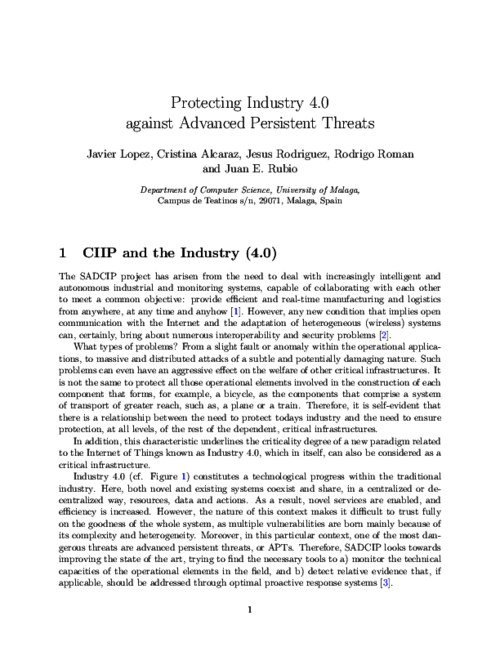 In particular, among its publications, we can highlight the analysis of cybersecurity threats that arise with the paradigm of Industry 4.0 and the concept of Industrial Internet of Things, interconnecting productive processes of all sectors with cutting-edge information and communications technologies. 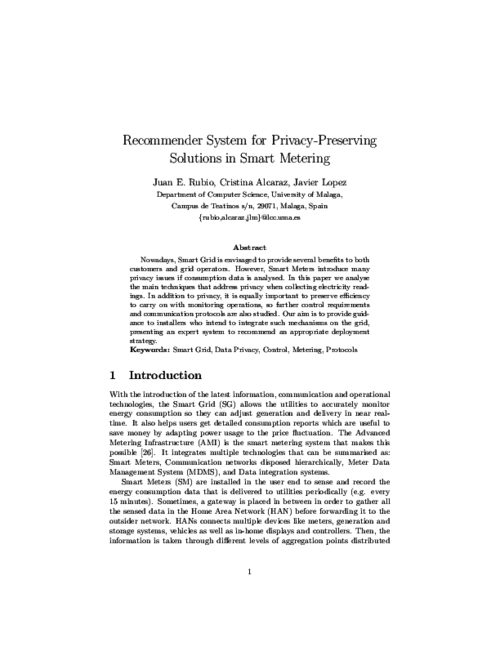 In this sense, Juan Enrique also has works in the design of mechanisms that preserve the privacy of users in the context of Smart Grid, and currently works in national and international projects related to these areas. The 12th International Conference on Critical Information Infrastructures Security, vol. Lecture Notes in Computer Science, vol 10707, Springer, pp. 119-130, 08/2018. 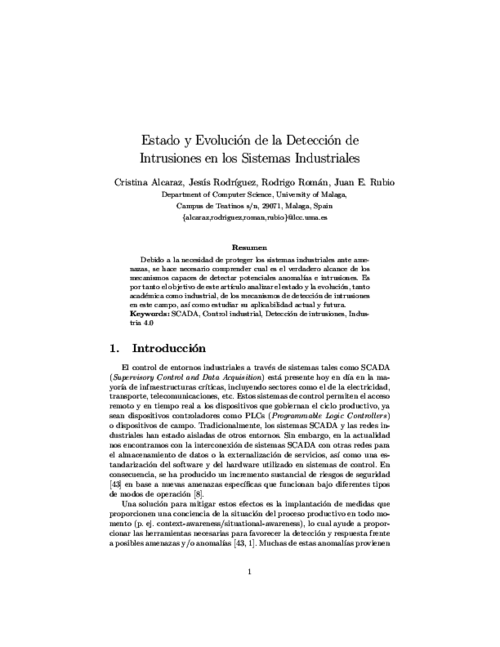 More..
IEEE Transactions on Industrial Informatics, vol. 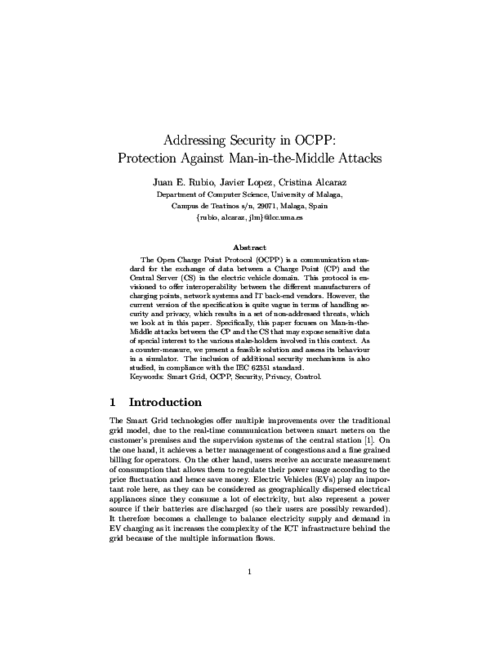 14, issue 8, IEEE, pp. 3745-3753, 08/2019, 2018. DOI (I.F. : 5.430)More.. The Smart Grid offers many benefits due to the bidirectional communication between the users and the utility company, which makes it possible to perform a fine-grain consumption metering. This can be used for Demand Response purposes with the generation and delivery of electricity in real time. It is essential to rapidly anticipate high peaks of demand or potential attacks, so as to avoid power outages and denial of service, while effectively supplying consumption areas. In this paper, we propose a novel architecture where cloud computing resources are leveraged (and tested in practice) to enable, on the one hand, the consumption prediction through time series forecasting, as well as load balancing to uniformly distribute the demand over a set of available generators. On the other and, it also allows the detection of connectivity losses and intrusions within the control network by using controllability concepts. Computer Networks, vol. 134, Elsevier, pp. 46 - 54, 2018. DOI (I.F. : 2.522)More..
9th IFIP International Conference on New Technologies, Mobility & Security, 2018. More..
III Jornadas Nacionales de Investigación en Ciberseguridad (JNIC 2017), 2017. More..
Debido a la necesidad de proteger los sistemas industriales ante amenazas, se hace necesario comprender cual es el verdadero alcance de los mecanismos capaces de detectar potenciales anomalías e intrusiones. Es por tanto el objetivo de este artículo analizar el estado y la evolución, tanto académica como industrial, de los mecanismos de detección de intrusiones en este campo, así como estudiar su aplicabilidad actual y futura. European Symposium on Research in Computer Security, vol. 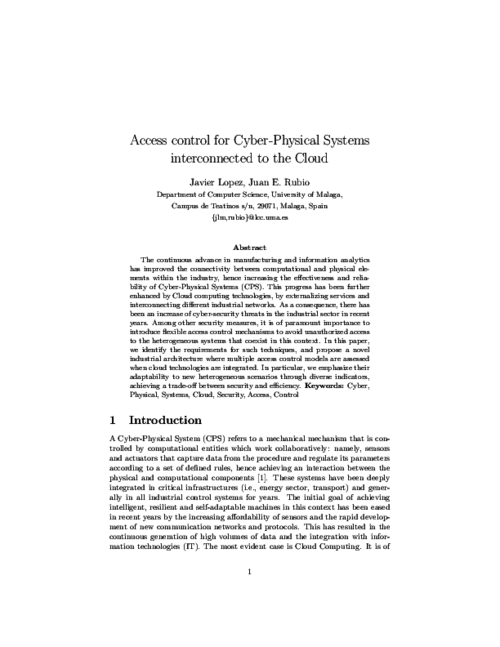 10493, 22nd European Symposium on Research in Computer Security (ESORICS 2017), pp. 402-418, 09/2017. More..
European CIIP Newsletter, vol. 11, issue 26, no. 1, European CIIP Newsletter, pp. 27-29, 03/2017. More.. Pervasive and Mobile Computing, vol. 41, Pervasive and Mobile Computing, pp. 205-218, 10/2017. (I.F. : 2.974)More..
Nowadays, Smart Grid is envisaged to provide several benefits to both customers and grid operators. However, Smart Meters introduce many privacy issues if consumption data is analysed. In this paper we analyse the main techniques that address privacy when collecting electricity readings. In addition to privacy, it is equally important to preserve efficiency to carry on with monitoring operations, so further control requirements and communication protocols are also studied. Our aim is to provide guidance to installers who intend to integrate such mechanisms on the grid, presenting an expert system to recommend an appropriate deployment strategy. The 11th International Conference on Critical Information Infrastructures Security, vol. 10242, pp. 176-188, 2017. More.. The introduction of the Smart Grid brings with it several benefits to society, because its bi-directional communication allows both users and utilities to have better control over energy usage. However, it also has some privacy issues with respect to the privacy of the customers when analysing their consumption data. 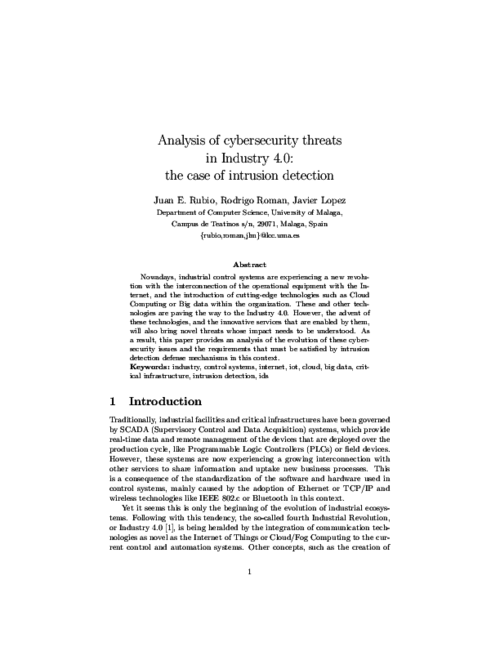 In this paper we review the main privacy-preserving techniques that have been proposed and compare their efficiency, to accurately select the most appropriate ones for undertaking control operations. 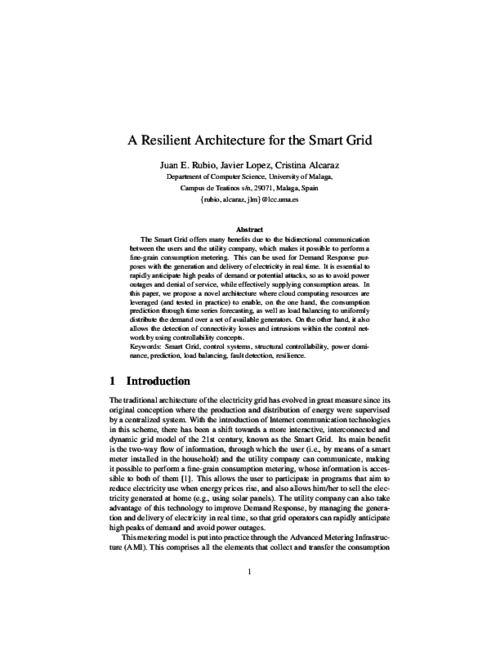 Both privacy and performance are essential for the rapid adoption of Smart Grid technologies.